Goldwork There are 6 products. Genuine Japanes gold thread, or passing, this thread is manufactured by covering paper with a very thin film of real gold. 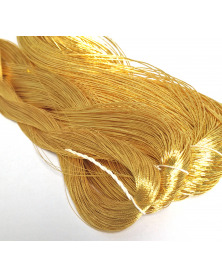 This golden paper is then wrapped around a silk core thread. This has been imported directly from Japan and is of very high quality. Gold embroidery sequins. These sequins do not come on strong, but loose. These are the typical sequins for Goudborduren be used, to recognize the small notch that was established for the manufacture of the sequins of real metal.